Obv: Bust of Saint Reinoldus between oblique crosses in triangle. Rev: King crowned with scepter and pomegranate. 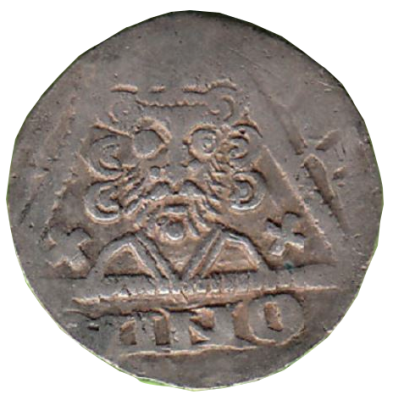 Note: Obverse design based on Henry III coinage of Ireland. Ref: Berghaus 82. Rudolf of Habsburg was Count of Habsburg from about 1240 and the elected King of the Romans from 1273 until his death. Rudolf's election marked the end of the Great Interregnum in the Holy Roman Empire after the death of the Hohenstaufen emperor Frederick II in 1250. 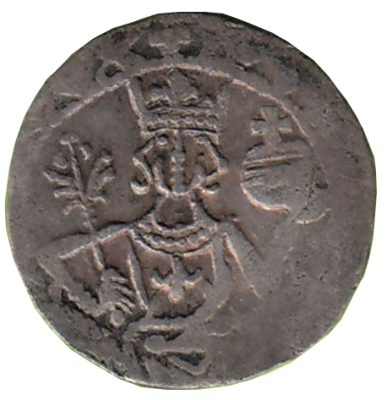 Originally a Swabian count, he was the first Habsburg to acquire the duchies of Austria and Styria in opposition to his mighty rival, the Přemyslid king Ottokar II of Bohemia, whom he defeated in the 1278 Battle on the Marchfeld.